© Estate of Peter Voulkos. Photograph by R. H. Hensleigh and Tim Thayer. Following a period of teaching at the vanguard Black Mountain College in North Carolina in 1953, ceramist Peter Voulkos traveled to New York City where he came in contact with the leading Abstract Expressionist painters of the period. His work changed dramatically, and he is credited with revolutionizing the concept of ceramics as an art form and with encouraging the use of ceramics as a means of deep personal expression. 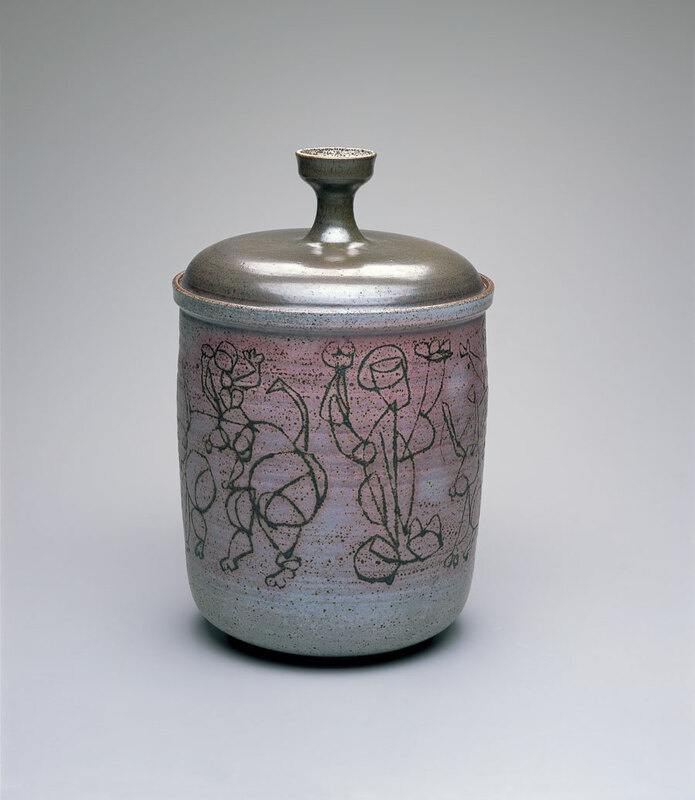 This jar was completed early in the artist’s career when Voulkos had just finished the graduate program at California College of Arts and Crafts, where he wrote his master’s thesis on lidded jars. It demonstrates his skill at expertly thrown functional objects with innovative design work, using native Montana clays, earth slips and glazes. The body of the jar is decorated with wax-inlaid line drawings, an adaptation of the wax-resist technique used in batik. His whimsical figures foreshadow the gestural expressiveness of form for which he became well known. Voulkos was a visiting artist to the Academy’s Department of Sculpture at the invitation of Michael Hall in the early 1970s.